The common light bulb seldom gets a second thought but, for something so common, it wasn't created in the finished form we see today. It is so common that it has become invisible. The only time that you pay attention to it, is when something has gone wrong and darkness prevails. The domestic tungsten filament bulb has been under siege due to its inefficiencies and is increasingly under the media spotlight. Its inefficiencies coupled with its widespread use do add up to quite a large amount of wayward energy consumption. Although domestic high wattage incandescent bulbs have been shown the door, with successive regulations in different parts of the world, they are still common in lower wattage versions such as in torches and vehicle's lamps. 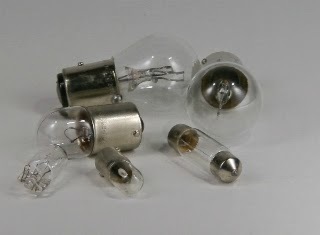 For the humble incandescent bulb, there is a long history of design considerations in its genesis. I have written an article describing this journey. In the article I describe, more, the technical considerations rather than who came up with what idea and when. The incandescent bulb in its current form is slowly disappearing but should we bemoan its passing when it is just part of the development cycle? The reason for its dominance is its cost and relative robustness. It is very cheap to produce and buy. The nail in its coffin is the escalating cost of energy production and the increasing demands of it. The cheap cost of bulb production is offset by the running cost. So other better technologies are now bridging the gap as they become more cost effective, especially as they receive investment in their manufacturing processes which further reduces their costs to the customer. Do you pay upfront or pay later? The spectre of energy security looms large for industrialised nations. The equation is changing and the hand is being forced by legislation rather than common sense. Personally, I think it is long past its time and we need to move forward. The incandescent bulb may look unassuming but it hides a fantastic design heritage. In common with all elegant designs its simplicity disguises its technical accomplishments. One that is still in progress! Is halogen the heir apparent?